This fresh and saltwater formula is labeled for “aufwuchs” eaters. Aufwuchs is a combination of green algae, diatoms, and small plants, along with tiny organisms such as insect larvae, crustaceans, rotifers, protozoans, and snails that live with them on the surface of hard substrates such as rocks. Many species of fish such as Mbuna cichlids, various plecos and gobies are specialized to feed on aufwuchs by scraping hard surfaces for whatever nutrients they can find. These species do eat a lot of low-caloric algae, but it is the small meaty treats that they relish and what really makes them grow and thrive. Soilent Green is a no-expense-spared blend of algae (25% of formula), combined with the highest quality whole aquatic animal ingredients, to provide a perfect balance of plant and aquatic animal proteins. 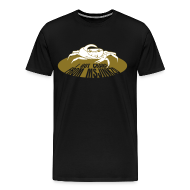 Soilent Green is perfect for more herbivorous fish, shrimps, crabs, and snails. 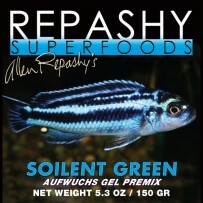 SOILENT GREEN Aufwuchs Gel Premix NET WEIGHT 5.3 OZ / 150 GR Our Meal Replacement Gel for Aufwuchs (algae and small living organisms) eating species of Fish, Invertebrates, Amphibians and Reptiles. Chlorella Algae, Spirulina Algae, Whole Krill Meal, Whole Squid Meal, Whole Sardine Meal, Alfalfa Leaf Meal, Whole Anchovy Meal, Germinated Brown Rice Protein Concentrate, Pea Protein Isolate, Dried Brewers Yeast, Stabilized Rice Bran, Dried Kelp, Carrageenan Algae, Konjac, Carob Bean Gum, Schizochytrium Algae, Calcium Carbonate, Dicalcium Phosphate, Taurine, Potassium Citrate, Calcium Propionate, Phaffia Rhodozyma Yeast, Paprika Extract, Calendula Flower Powder, Marigold Flower Extract, Rose Hips Powder, Turmeric Root Powder, Malic Acid, Sodium Chloride, Canthaxanthin, Potassium Sorbate, Magnesium Gluconate, Lecithin, Rosemary Extract and Mixed Tocopherols (as preservatives), Vitamins (Vitamin A Supplement, Vitamin D Supplement, Choline Chloride, Ascorbic Acid, Vitamin E Supplement, Niacin, Beta Carotene, Pantothenic Acid, Riboflavin, Pyridoxine Hydrochloride, Thiamine Mononitrate, Menadione Sodium Bisulfite Complex, Folic Acid, Biotin, Vitamin B-12 Supplement). Guaranteed Analysis: Crude Protein min. 45%, Crude Fat min. 6%, Crude Fat max. 8%, Crude Fiber max. 8%, Moisture max. 8%, Ash max. 12%, Calcium min. 1.5%, Calcium max. 2%, Phosphorus min. 0.75%. To prepare one cup of product, add ¼ cup of powder into ¾ cup of cold water and stir until blended. Microwave until it starts to boil (typically 2-3 minutes), remove and stir. Alternatively, bring water to a boil on stove, remove from heat, and stir in powder. Immediately pour into a storage container or mould, and let sit at room temp until firm. The finished gel can be cut into cubes, shredded, or used as a whole slab. Whatever is not used immediately should be treated as fresh food. It can be stored sealed in refrigerator for up to two weeks, and in freezer for up to six months. To adjust firmness of gel, use more or less water as desired. MADE IN USA. Not for Human Consumption.